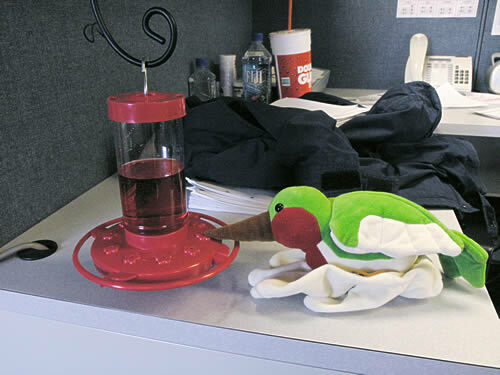 One of my coworkers brought in a hummingbird feeder a couple days go. It has been sitting on a file cabinet, waiting for someone to install it in the tree branches outside our second story windows. I noticed today that the feeder had been filled with hummingbird attracting liquid/potion/elixir/potion/fluid/formula. To the amazement and amusement of everyone in our department, a rare species of hummingbird almost immediately found its way into our office and started feeding on the juice. She got so chubby from overeating that she was forced to alight on a soft nearby glove. Now that's not something you see every day!